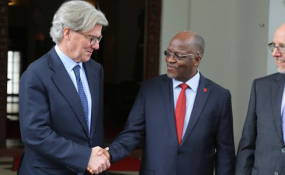 Dar es Salaam — President John Magufuli has met with Prof John Thornton, Chairman of Barrick Gold Canada, parent company of Acacia Mining to discuss the mineral sand saga at the State House on Wednesday. The new development comes after Dr Magufuli received two reports on the exportation of mineral concentrates abroad for smelting. The first committee probed at the technical aspects of the concentrate and the second committee examined at the economic and legal frameworks around the export. Both reports damned Accacia for foul play and suggested that Tanzania has lost over Sh100 trillion since it started exporting concentrates in late 1990s. Dr Magufuli who was accompanied by the Minister for Legal and Constitutional Affairs Prof Palamagamba Kabudi said the meeting was successful and Barrick have "repented" for what has happened and they are ready to compensate Tanzania for the loss that the incurred over the years. In a 1:32 video clip tweeted on the official government spokesperson account, Dr Magufuli said, "He (Prof Thornton) will dispatch his team to the country and we will have our team as well. They will jointly discuss our findings and repay all the losses that we as a country incurred." Barrick Gold Canada is the largest shareholder of Accacia Mining Company with 64 per cent stake. On March, 2017 the export of the mineral concentrates from Tanzania was stopped by Presidential directives.